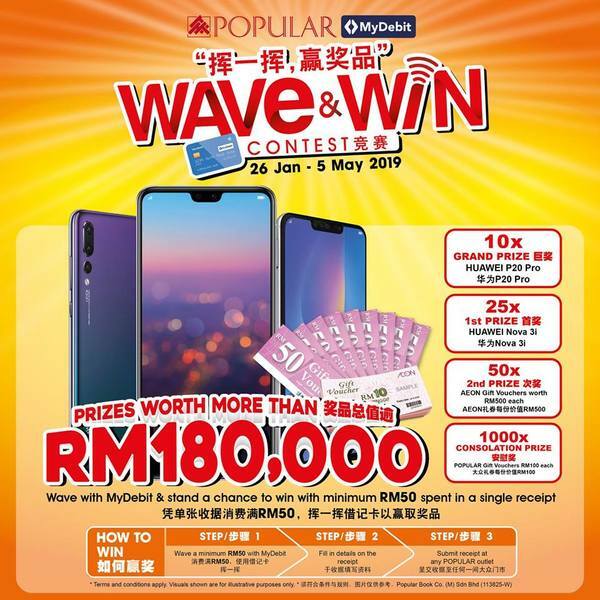 From 26 Jan – 5 May 2019, wave with MyDebit with a minimum purchase of RM50 in a single receipt and stand a chance to win PRIZES WORTH MORE THAN RM180,000! Wave & Win, it’s really simple to win your share of RM180, 000 in prizes at any of your nearest POPULAR/ HARRIS Bookstore. Purchase a minimum of RM50 in a single receipt/transaction using MyDebit ATM card contactless method and stand a chance to participate in the Popular Book MyDebit Wave & Win Contest. (eg. ONE (1) transaction = 1 entry). Complete Contest Form and submit into the designated contest box in the outlet.